After a preliminary play-in round with two Madden NFL 13 cover choices from each NFL team, the results are in: the bracket you see above contains the people's top 32 picks for sports gaming's most storied cover. You can cast your votes in Round One right now at ESPN.com/MaddenVote. Each round lasts for one week, with a recap of the previous round coming every Wednesday at 5 PM EDT on ESPN's SportsNation. 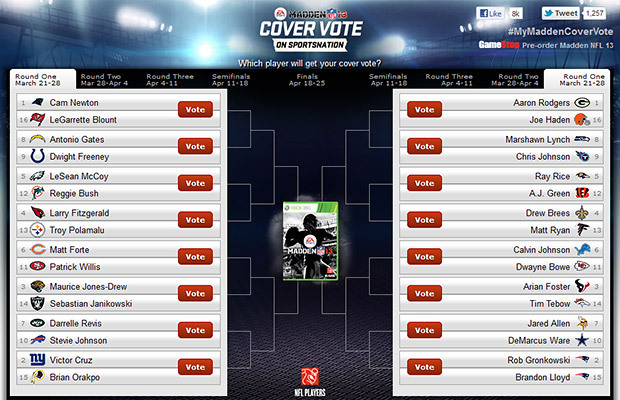 Starting at 9 AM EDT tomorrow, March 22, fans can set up their own voting brackets on the Madden NFL Facebook page, vying for prizes such as copies of Madden NFL 13 and Super Bowl tickets. The St. Louis Rams are the only team without a candidate: their original representative, wide receiver Brandon Lloyd, signed with the New England Patriots after the play-in round began, giving fans of the Super Bowl XLVI losers a second choice alongside tight end Rob Gronkowski. He and his surgically repaired left ankle probably don't want to be on the Madden box, anyway.